Several days ago I finally moved my blog to a new domain. Now its main location is http://sp2013.pro. Old domain (http://sp2013-blog.com) and old direct links will be either accessible for about a year, but it is better to update bookmarks even now. I have prepared quite a few interesting posts, but for a while they are only in my mind and in some pieces of code. 🙂 I hope I’ll find some time to publish them soon. So, stay tuned! 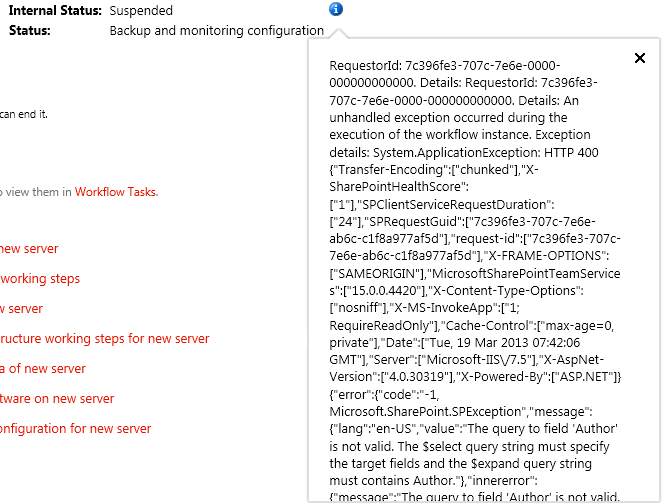 Solution: SharePoint 2013 workflow. 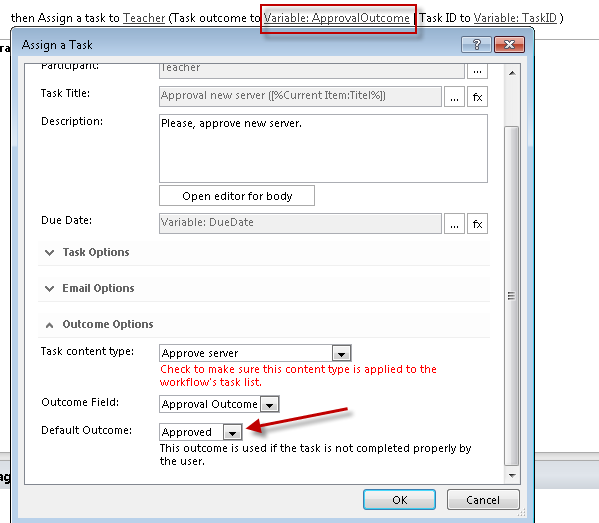 Custom task outcome always sets to default value. Yesterday I stumbled into an issue. 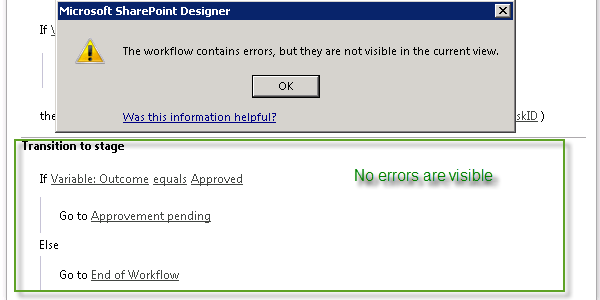 My custom task outcome of SPD 2013 workflow stopped to function properly. It set to default value regardless of the Task Outcome I set programmaticaly in my custom ASP.NET task form. But when I pressed “Reject” or “Approve” button in my form, my ApprovalOutcome variable set to “Approved”. When I changed Default Outcome to “Rejected” this variable set to “Rejected” regardless of pressed button. Usually in this case you really can’t see the place where the error is and it seems like everything is OK. I spent some time to understand where the error is when I saw this error the first time. Most likely it is an issue in SPD; however, it is rather simple to overcome it and force SPD to show the place the error is. The solution: you just have to save your workflow (by pressing Save button in the ribbon), close it and open it again (by selecting it in the Navigation\Workflows and pressing the “Edit workflow” link). I stumbled into this moment several times after copying-pasting my workflow. It seems like this new feature works well in the most parts of the workflow, except the Transition to stage part. At least, in my cases after pasting I had to repair fields in the Transition to stage part only. The words about ContentTypeId helped me to identify the cause of the issue quickly. In my new workflow task list defered from the one in the old. 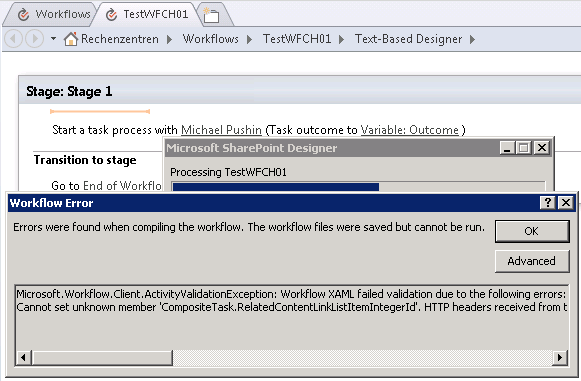 Hence, it didn’t have my custom task content types and WF failed when tried to create a task. So, the solution is pretty simple: Make sure whether your task list contains your custom task content types. If you remeber that you have added them, check whether your WF uses that list (maybe your WF uses another one). Hope it saves somebody some time. Several hours ago, Microsoft released Visual Studio 2012 Update 2. This update includes several improvements for SharePoint 2013 development. Support is now provided for web and load testing for SharePoint applications. Support is now provided for record and playback through Coded UI to perform UI validations on SharePoint 2013 applications. IntelliTrace support is the same as that provided in SharePoint 2010. Microsoft.Workflow.Client.WorkflowCommunicationException: The request was aborted: The request was canceled. Client ActivityId : 7a290e9c-0917-7088-afc4-e65fd25c5c0b. ---> System.Net.WebException: The request was aborted: The request was canceled. 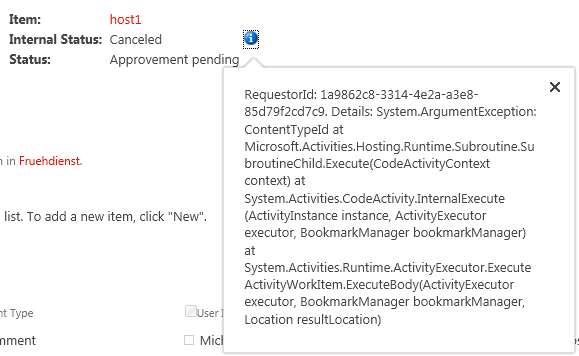 ---> System.ServiceModel.ServiceActivationException: The requested service, 'net.pipe://localhost/SecurityTokenServiceApplication/appsts.svc' could not be activated. See the server's diagnostic trace logs for more information.